This year I want to read more of the books I already own and to make me do that, I’m joining Mount TBR reading challenge by My Reader’s Block Blog. 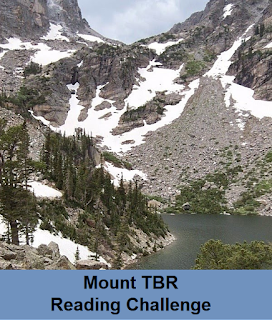 I’m choosing a light start with 24 books, Mount Blanc, but I’m hoping to increase the goal later this year. At first, I was only going to include print books, even though I have a lot of ebooks and ebook collections which have been waiting for… years in some case. However, I’m also going to include ebooks from Storybundle.com’s bundles because then it’s easy to remember when I bought them and how long they’ve been waiting. Hopefully, some of my books in this challenge will cross-over with the action heroine challenge but we’ll see. I’m going to join the 11th Annual Graphic Novel & Manga reading challenge for this year, too, with the goal of Bronze Age, 24 reviews. The challenge has moved to a Facebook page. What counts: graphic novels, collected trade editions, manga, comic strip collections, comic books or combinations of text and bubbles all in the same book. In print or digital. Anything else you feel is suitable. My personal criteria are if it has either frames OR speech bubbles it counts. I also feel many picture books and zines fall under this criteria as well. I’m not going to be the comic police but if you are unsure, ask me in the comments any time. You must write a review and link to it for it to count towards the challenge. Reviews may be posted on your blog or goodreads or similar places. Several reviews may be gathered and posted in one link on your blog, but each book must be linked here to count. Do not post your actual review here on the group. I have a stack of Birds of Prey albums and individual comics to start with. I think I’m going to continue with the Astro city albums but we’ll see. 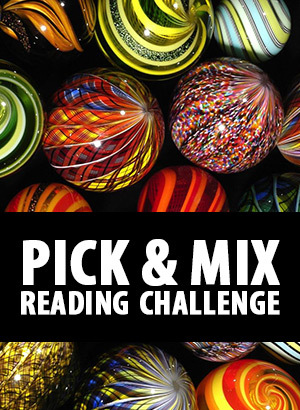 I’m going to join the Pick&Mix reading challenge for this year, too, with the goal of 20 books. Since I’m also going to join Mount TBR challenge, for my print TBR books, I’m going to gather all the other books to Pick & Mix. Print books from library, or bought this year, audiobooks, and ebooks. Many, if not most of them, will be continuing series. 35, S. P. Somtow: Do Comets Dream?